How many F-35 Joint Strike Fighters does Australia have on order? Australia has on order 72 F-35 Joint Strike Fighter (JSF) planes. The problem? For years many have been saying that they’re simply… not very good. Yet public debate over this large purchase has been largely absent, though Canada’s rethink could drive up costs further for other nations. Defense procurement stories from Australia in 2015 have largely been submarine, submarine, submarine, naval destroyer, submarine. However, between the back-to-back sea defense news and opining there’s one air story worth paying attention to: the large F-35 purchase. Australia is due to buy another 58 after a commitment from Tony Abbott last year, upping the force to a total of 72, at a cost of around A$98 million ($70 million) per plane. The total purchase cost will be, according to the Royal Australian Air Force (RAAF), around A$12.8 billion, and the same again for upkeep. The F-35s are to replace the RAAF’s 71 Hornets (six Super Hornets are currently in Syria and Iraq). Where did Indian Prime Minister Narendra Modi travel for a state visit last week? Fresh out of his party’s defeat in the Bihar elections — a result that may have shaken foreign investor faith in his government’s ability to pursue swift reform — Indian Prime Minister Narendra Modi spent the better part of this week in the United Kingdom for his first state visit there as India’s head of government. Modi and his counterpart, David Cameron, issued a joint statement on their “global partnership.” Additionally, Modi and Cameron issued a joint statement (PDF) outlining a range of agreements between the two countries, specifically on the issue of climate change. Modi also addressed the British parliament, becoming the first Indian head of government to do so. The headlining deal of Modi’s state visit is an agreement on increasing bilateral cooperation on civil nuclear cooperation, finalizing a 2010 bilateral agreement. “The two prime ministers welcomed the successful conclusion of negotiations on a bilateral Civil Nuclear Cooperation Agreement providing a framework for further cooperation, and announced the signing of a MoU between the U.K. and the Indian Department for Atomic Energy to encourage joint training and experience sharing on Civil Nuclear with the Indian Global Center for Nuclear Energy Partnership,” Modi and Cameron noted in Thursday’s joint statement on energy and climate. “The conclusion of the civil nuclear agreement is a symbol of our mutual trust and our resolve to combat climate change,” Modi said. What event caused major protests in Kabul, Afghanistan last week? Which African country did a senior Chinese People’s Liberation Army general visit last week, sparking speculation that Beijing is looking to set up its first overseas military base there? The chief of the general staff of China’s People’s Liberation Army, General Fang Fenghui, visited Djibouti this week, where he met with the president, foreign and defense ministers, and the chief of staff of the Djibouti Armed Forces. China Military Online has an outlineof Fang’s visit. The trip sparked more speculation that China is moving to opening its first overseas military base in Djibouti, as detailed in this DefenseNews story. Djibouti’s President Ismail Omar Guelleh has been open that the two sides are discussing a Chinese military base, although no Chinese officials have confirmed the reports. China regularly participates in anti-piracy operations in the Gulf of Aden; having a military base in Djibouti would provide easy access to resupply and support facilities. The United States, Japan, and France already have military bases in Djibouti, which is strategically located at the junction between the Gulf of Adan and the Red Sea. Which of the following Asian countries is not known to be developing and testing supersonic or hypersonic missiles? The fact that China carried out four tests of its hypersonic vehicles in a span of just 18 months demonstrates the commitment of Beijing to the development of the technology. Once operational, these capabilities would be sufficient to neutralize U.S. strategic missile defenses; they will be able to avoid triggering early-warning systems or detection by radar. The critical military value of hypersonic systems lies in this ability to strike with unprecedented speed and precision. Last week, two U.S. bombers were contacted by Chinese air traffic controllers over what region? What was the outcome of Myanmar’s historic general election? 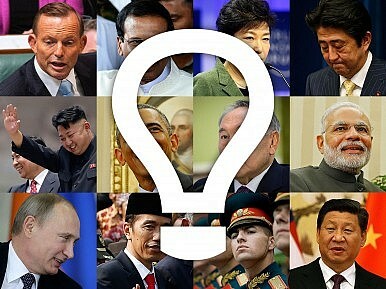 Which of the following Asian leaders will not be attending next week’s Asia-Pacific Economic Cooperation (APEC) summit? Indonesian President Joko “Jokowi” Widodo will skip a key summit in the Philippines next week in a move that will raise further questions among some about his administration’s commitment to regional multilateralism. According to Ari Dwipayana, a member of the presidential communications team, Vice-President Jusuf Kalla is scheduled to take Jokowi’s place in the Asia Pacific Economic Cooperation (APEC) summit in Manila from November 17 to 20, where confirmed state leaders in attendance include U.S. President Barack Obama and Chinese President Xi Jinping. Why was the Pakistani port of Gwadar in the news last week? Which of the following countries sent a military delegation to North Korea last week? A Russian military delegation arrived in Pyongyang on Monday to conduct a military-to-military dialogue with the command of the Korean People’s Army TASSreports. The Russian delegation, headed by First Deputy Chief of Russia’s General Staff Nikolay Bogdanovsky, is slated to begin talks with their North Korean counterparts this Wednesday and will stay in North Korea until November 13.